Rome places 3 Carthaginian CUs in Lilybaeum. Etruscan/Samnite places 2 Samnite CUs in Praeneste, 2 Etruscan CUs and Minor Leader-B in Pisae and 1 Etruscan CU in Tarquinii. Gaul places 4 CUs in Sena Gallica and 2CUs in Bononia. Greece places 2 CUs in Capua. Rome places 5CU in Narnia. Rome removes his Consuls from the map and draws two new ones. Greece, will you remove Dionysius or city loyalty? Rome, where would you like to place your new Consuls. 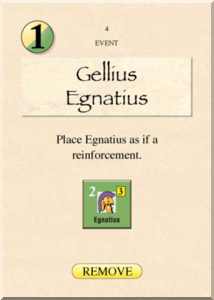 Also, Etruscan/Samnites, would you like to discard you last card in hand before drawing new cards? Keep the card. I like that card. Greece reduces Capua's loyalty by 2 to keep Dionysius. Rome places Laevinius in Velitrae, and Valerius in Roma. 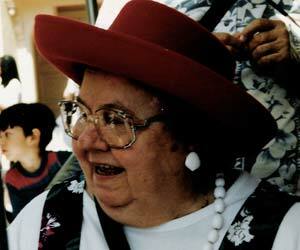 Etruscans have not lost five or more home spaces; Etruscans retain the ability to bribe. Etruscan/Samnite discard pile is shuffled back into deck due to play of Reshuffle card last turn. Etruscan/Samnites keep 1 card in hand and draw 6. 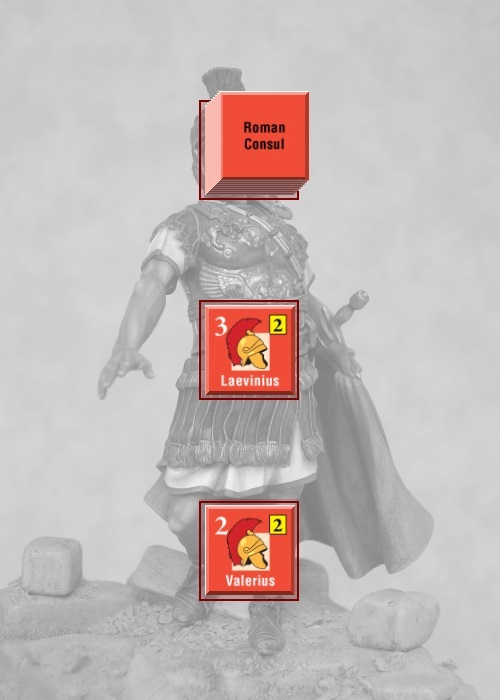 Romans, please choose the first player for the Turn. Hand images have been sent. Let me know if there are any problems. Gauls can go first - traveling in a remote portion of New Mexico this week and will only have service in the evenings until Friday. Gauls, you may begin the first Action Round. 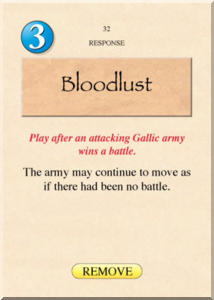 Gauls play Bloodlust for 3Ops, activating Minor Leader-C in Faesulae. Minor Leader-C and 2CU move through Bononia and Ariminum to Sena Gallica, picking up 4CUs. Then, Minor Leader-C and 6CUs move through Sentinum to Spoletium. Etruscan/Samnite is now the active player. Gellius Egnatius will lead the Samnite Army. Let's hope it goes better this time around. You want him to replace Minor Leader-A? Yeah, Minor Leader-A is an idiot and smells funny. Etruscan/Samnites play Gellius Egnatius for the event, placing Samnite leader Egnatius in Praeneste. Samnite Minor Leader-A is removed from Praeneste. Greece is now the active player. Play Rebels Executed for Ops, activating Dionysius and 5 CU. They will move to Neapolis and then take Naval Movement to Syracusae. Romans, would you like to have the Carthaginians attempt to avoid battle? They may do so by sea to any friendly port. 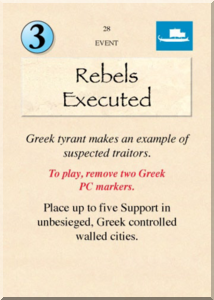 Greeks play Rebels Executed for 3Ops, activating Dionysius. Dionysius and 5CUs move to Neapolis and then Naval Move to Syracusae. Romans choose to have Carthaginians attempt to avoid battle. Avoid battle attempt is successful. Hamilcar and 4CUs move to Lilybaeum. Siege of Syracusae is lifted. Greek Minor Leader-B is removed from Syracusae. 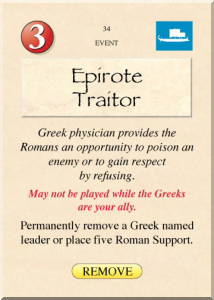 Romans play Epirote Traitor for the event, removing Dionysius from the game. 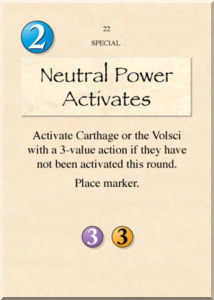 Romans play Neutral Power Activates for the event, activating Hamilcar. Hamilcar and 7CUs move to Syracusae through Selinus and Agrigentum. Greeks, do you have a reaction? Is "cry" a legal reaction? Haha. 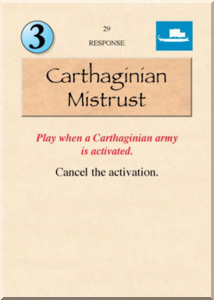 Greeks play Carthaginian Mistrust to cancel Hamilcar's activation. It is now Action Round 2. Gaul is now the active player. Forward Men! To Glory! To Victory! Tonight we shall feast on their Entrails! We shall dine on their Women! My men will Stand and Fight, ready to show the dirty barbarians what for! 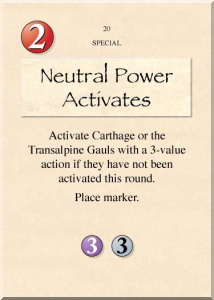 Gauls play Neutral Power Activates for 2Ops, activating Minor Leader-B. 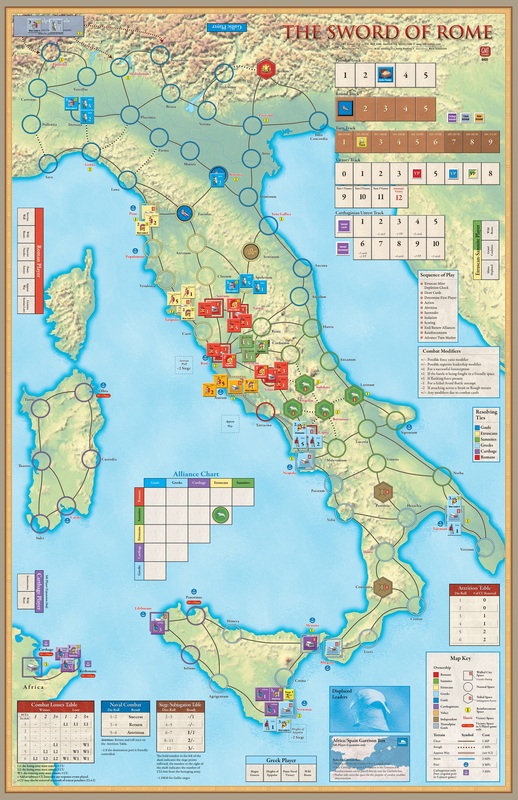 Minor Leader-B and 7CUs move through Genua and Luna to Pisae. Etruscans decline to retreat into the City. 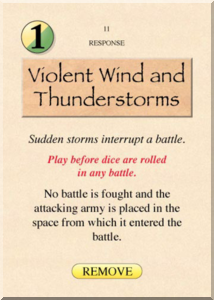 Per PM, Etruscan/Samnites play Violent Wind and Thunderstorms in Response, cancelling the battle. Gallic army is placed in Luna. Given the unbridled hostility of our northern neighbours, the Etruscans propose an alliance to their Roman brethren in order to stem the tide of the barbaric hordes. The Sammnites will remain neutral. Boooh I say, by Teutates! Oh, yeah, diplomacy does not count as a turn. Plop down 3 Transalpine Gauls reinforcements. Phone posting, can't remember what the card is called. Blood something something. EDIT: Play Bloodshed Beyond the Alps for the Event.